It is sad to see how many people in our world are caught up in landslides of anxiety and depression. Everytime you turn around you see a new commercial for a pill that claims to alleviate the symptoms of one or the other. I have always felt that the solution is much simpler. It is that simple, If I sat around and thought about all the mistakes I have made in my life and the opportunities I have missed and the bad gigs I have had. I could become depressed in an instant! It is that simple, If I kept worrying about a gig I have next Saturday and I keep thinking that I am going to have a bad night with my voice because I am a little hoarse. I would become extremely “anxious” and be miserable. To some extent a little sadness (depression) is normal, as is a little (worry) is normal. They can be motivators. For example; a little worry might help you get your taxes done on time. He doesn’t even have time to think about it, he just jumps for his life! As he is falling he looks down and sees a river full of crocodiles awaiting his arrival. Snapping their jaws! He grabs a branch that extends from the side of the mountain with one hand and hangs on for his life. He is able to stabilize and grab with his other hand another branch and he looks up. There is the bear growling and licking his lips. He looks down and there are the hungry crocodiles. Then in front of his face he sees a strawberry plant with a luscious ripe red strawberry right in front of him. He plucks it and pops it into his mouth and the moment is perfect! You see the message in this parable is beautiful. Live in the moment! They say “a picture is worth a thousand words” I agree. He sure looks like he is living in the moment macking that strawberry! I have always been super curious about life. Not long ago I was at a BBQ in East Texas with some very dear friends. One of the friends of the family I was visiting has been in the funeral home business for several generations. Standing around drinking beer and talking I started asking this gentleman question after question about the funeral home business and what it’s like. So many people are afraid of death and we sanitize it so much in our society and hide it from everyone that I think that is a bit sad. I held my cat Battleaxe’s paw as she passed away and my vet left me alone with her body for awhile so I could just let go and find some inner peace at that moment. Subsequently a few weeks later I was visiting again and he got a call to pick up a couple of bodies of deceased people. I was there and he asked me if I wanted to go. I did. Out of respect for the bereaved (I don’t know why but I love that word) and I have always wanted to type it. So there it is. Anyway out of respect I won’t mention any names but I can tell you the entire process was one of the most serene and interesting experiences I had ever had in my life. I watched as my friend washed the body, prepped the carotid artery drained the blood from the body and completed the entire embalming process. You would think that something like this would gross me out but it didn’t. It awoke in me the fragility of life and how precious our friends and loved ones are. I was extremely in the moment during the entire process and I still remember the person’s name and everything. I will as long as I live. It had that much of an impression on me. The family brings the clothes that the person requested for burial and often they will bring a photo. This is so a makeup artist that works for the funeral home can do their best to make the person look like they did for the viewing process. I am glad I had the curiosity and the courage to experience that and I have to be honest I always wanted to see what happens to us when we die. I am not content living my life “on the surface” and not living. In my opinion, If you are not afraid to die than you can live! Check out this poem “Present Tense” this was written by a 14 year old kid named Jason Lehman. If you are not going to love yourself, who is going to do it for you? Great Job on “Live in the Moment”! Stress and depression can destroy your mental and physical health. Having good friends like you and hearing good music and humor every day keeps my mind on Living in the Moment. Thanks Eric!!! It’s also a fine balance between the hippie-ish “Just be in the Now! Yay!”, yet still being realistic enough to engage the world. Especially with what you and I know about the true state of the economy, and where global power is heading, it’s important, now more than ever, to really do what you love to do. You never know when you won’t have the chance to anymore. Take care, man. Strong work on the blog! Very insightful article and I couldn’t agree more. Think about some of the side effects that some of these pills have. This just from Paxil which release anxiety. Hey Eric! Aya told me about this website, and I thought I’d check it out. That last article you posted was really great, and I’ll be sure to remember it. These articles really thought provoking, and I can learn a lot from them. Keep posting sensei, and I’ll keep reading. I was on a plane once with my mom when we hit severe turbulence and all passangers were in a state of chaotic panic, as if they knew they were about to die. I will never forget that moment. She was in absolute peace during a state of panic, and remained calm when everyone was screaming and crying after the air masks popped down. She embraces death because she is at such peace with herself and it made me realize how much work I need to do on myself to reach my mom’s level. Deeply appreciating everything you have is the biggest step to get there. 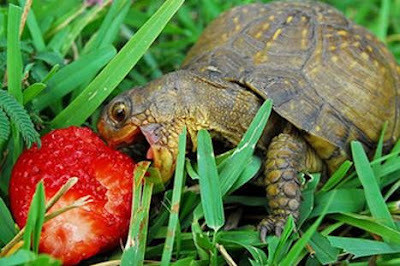 PS love that strawberry turtle picture!